HP Sprocket 200 Pocket Smartphone Photo Printer Limited Edition Gift Box Grey. Canon PIXMA MG3050 3-In-1 Wireless WiFi A4 Inkjet Printer Only Deal + FREE P&P! 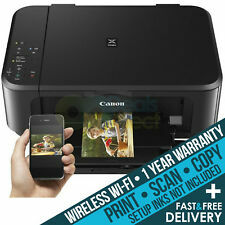 4 out of 5 stars - Canon PIXMA MG3050 3-In-1 Wireless WiFi A4 Inkjet Printer Only Deal + FREE P&P! 62 product ratings62 product ratings - Canon PIXMA MG3050 3-In-1 Wireless WiFi A4 Inkjet Printer Only Deal + FREE P&P! 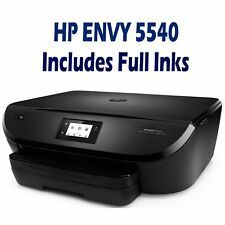 HP Envy 5540 / 5544 All-in-One Wireless Printer Copier Scanner Full Inks The best price on eBay with full inks - Print Straight away ---Touchscreen Controls ---Excellent Condition ---Includes Original HP Power Lead ---Print directly from your Tablet or Smartphone (Apple & Android) ---Includes High Quality Full Ink cartridges (Colour & Black)* ---Quiet Mode ---2 Sided Printing ---FULLY CHECKED & TESTED BY OUR ENGINEER ---May have very slight cosmetic marks *The high yield Inks are remanufactured and fully refilled by Easi-Printing to industry standards in a controlled environment and fully tested and checked. The Inks will come inserted and setup on your printer to produce high quality prints every time. WIFI Printing. Up to 33ppm. Satisfy modern office demands with HP Print Forward Design. Manage costs with affordable, professional-quality colour. Easily manage print jobs directly at the printer. Digital Radios. Personal Care. Canon PIXMA MG5550/5650. Printing quality is amazing. It contains Printer in Good condition, Original Power cable. May have light marks or minor scratches due to transportation. ”. Printing Quality is Amazing. HP Laserjet P3015dn Printer for sale, Duplex Network Printer, Plenty of Genuine HP Toner remaining. A full set of compatible ink for this printer is £15. Wireless and PictBridge. HP LaserJet 1320. Mono A4 Duplex USB, Parallel Laser Printer. Connectivity: USB, Parallel. Drivers available from HP website. 250 Sheet Input Tray. All-In-One printer - PIXMA MG3650. Canon PIXMA MG3650. Print and scan using smartphone or tablet with PIXMA Printing Solutions app. PIXMA Printing Solutions app. Optional high yield inks. With fast, high-quality print, copy and scan, it also supports Google loud Print and Apple AirPrint. Looking for an affordable, stylish and easy-to-use printer?. Keep things simple – that's the mantra behind the XP-255. It provides a range of essential features while being incredibly easy to use. Has been tested. A PIXMA Cloud Link also allows you to print and scan from wherever you are, helping to make your life even easier.Experience wireless, convenient printing and scanning with the Canon PIXMA MG5750 All-in-One Wireless Inkjet Printer. UK Spec. Same day shipping before 2.00pm. UK VAT reg. With individual inks, users will only ever need to replace the colour used, helping save costs. Wi-Fi Direct: Wireless printing without a network. Compact Wi-Fi all-in-one: Print, scan and copy. Get more for your money with individual inks –only replacing the colour that is used. 50 sheet paper capacity. Printer is working perfectly and is in pristine condition, like new. Best printer I ever had. What Brother says about it: Compact Up to 20ppm printing speed Up to 2,400 x 600dpi print resolution Up to 250 sheet paper capacity High speed USB 2.0 connection I'll post within the UK only (signature required). Collection is possible too. Let me know if you have any questions. Thanks for looking! With a nine month free trial of Instant Ink, you'll have everything you need for your project. Easily connect the Envy 5546 to your smartphone, tablet or PC to print wirelessly. Create borderless imagery and print 10 x 15 cm photos in brilliant colour with ease. ZEBRA LP2844Z THERMAL LABEL PRINTER. PART # LP2844Z. ZEBRA THERMAL LABEL PRINTER. USB / SERIAL / PARALLEL INTERFACE. USB CABLE INCLUDED. Unmatched print, scan, copy, and fax performance plus robust, comprehensive security for how you work. This colour MFP finishes key tasks faster and guards against threats. Connectivity - Wireless, AirPrint, Network, USB, NFC, Google Cloud Print. Lexmark CX310dn Colour Laser MFP - As New. It is in 'as new' condition - it is under a year old, and has printed less than 4,500 pages. It prints and scans perfectly, with no smudging. As you would expect, there is scarcely a mark on it. 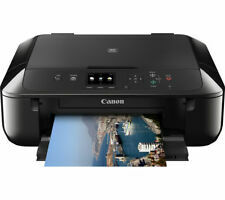 Canon PIXMA MG5750 All-in-One Wi-Fi Printer. Series MG5750. PIXMA MG5700 Series. Take a more detailed look into the Canon PIXMA MG5700 Series. Experience the creative freedom of cloud printing and scanning with enhanced PIXMA Cloud Link. ZEBRA GK420D - USB. Model: GK420D. Thermal Direct Printer. Thermal Printers - 203Dpi Printhead (Tested - Perfect Condition). USB SERIAL INTERFACE CONNECTIONS. THIS PRINTER IS SOLD INCLUDING Label Printers. Samsung M2026 A4 Printer Xpress Mono Laser Printer. Print and share effortlessly with the Samsung Xpress M2022 printer. Samsung Xpress Printer. Save up to 20% on printer toner with Samsung's Easy Eco Driver. Canon PIXMA MG5750 Printer XL Compatible Inks Bundle. Take a more detailed look into the Canon PIXMA MG5750. All-In-One printer - Canon PIXMA MG5750 Wireless Wi-Fi Printer. Simply download the Canon PRINT app and you can effortlessly print and scan using your smartphone or tablet, and directly access cloud services. Canon PIXMA MG2550S Printer. Take a more detailed look into the Canon PIXMA MG2550S. Find out more about the Canon PIXMA MG2550S, its features and what it can do. Unique printing and ink technologies in PIXMA printers give outstanding, high quality prints. HP Sprocket Photo Printer White. HP Deskjet 3720 All-in-One Wi-Fi Multifunction printer Print, Copy, Scan. EcoTank technology uses bottles of ink giving you many more printed pages than conventional printers. You can get up to 14,000 black pages and 5,000 coloured pages – that's enough for around three years of printing. HP Printer Set Up Ink Quick Print. Powerful Protection. You can print almost instantly - no waiting. This printer is faster than competitors wake up and print. More page. For even more power. Save energy and can easily manage your tasks. EPSON 1500W A3+ PHOTO PRINTER for repair. EPSON 1500W A3 PHOTO PRINTER FOR REPAIR with CISS bulk ink system and waste ink tank, in working condition but needs a new print head, bought as seen with various bottles of pigment ink and two sets of reusable ink cartridges, buyer collects. All the other accessories are included in this printer including the Ink. The only thing which is missing is the printer head. The Eco Driver on the Xpress M2026 can help you to save on your printing costs by keeping energy use low. It is Energy Star qualified, so you can be sure your printer won't be using too much energy. INDIVIDUAL INKS – only replace the colour used. THE COLOURING BOOK FEATURE ALLOWS USERS TO CHOOSE AN IMAGE FROM THEIR SMART DEVICE, CONVERT IT TO A LINE DRAWING AND PRINT OUT FOR COLOURING IN. A choice of standard or XL inks. Canon PIXMA MG3050 All-In-One Wireless WiFi A4 Inkjet Colour Printer. Experience the freedom of Wi-Fi connectivity. Print from the cloud. Fast print speed of 8 ipm mono, 4 ipm colour. High-quality prints. Technical specifications for CANON PIXMA MG5750 All-in-One Wireless Inkjet Printer. A PIXMA Cloud Link also allows you to print and scan from wherever you are, helping to make your life even easier. Print technology Inkjet. I have upgraded to a newer printer and the Canon Pixma Pro 9000 MkII has not been used for 3 months but at last usage, it worked well and the print quality was top notch. HP ENVY 4520 All-in-One Printer is part of the HP Envy series. It is HP instant ink ready out of the box. HP ENVY 4520/4524/4527 All-in-One Printer, Inkjet Printer. HP Envy 4520 All-in-One Instant Ink ready printer. Whether using a smartphone or tablet, the iPrint app1 can be downloaded to a range of devices for truly wireless printing and scanning. For added versatility, Wi-Fi Direct allows easy printing from compatible wireless devices without the need for a network connection.